After the release of China’s main economic indicators of the first half of this year, global media clearly noticed that the advanced manufacturing and service industry had a strong growth trend in the country. Reuters reported that China’s engines for driving economic growth are further improving. A series of data showed that the transformation of old and new driving forces in China are pushing the transformation and upgrade of China’s economy. In 2016 new driving engines contributed 70 percent of newly-added jobs. The first half of 2017 online sales saw an increase of 33.4 percent year-on-year, triple the growth speed of total offline retail sales. The logistics kept an increase speed of above 30 percent, and the value added in strategic new emerging industries and high-tech industries increased 10.8 percent and 13.1 percent, respectively, year-on-year. At a symposium chaired by Premier Li Keqiang in April, the Premier stressed the need to transform old growth engines to new ones, saying that the new development concept of innovation, coordination, green, opening-up and sharing should be implemented to complete the transformation. To stick to the concept of innovative, coordinated, green, open and sharing development, while promoting an upgrade of growth momentum, environment and support are two basic elements. Administrative streamlining and service optimization can create a better environment for new driving forces’ growth, and entrepreneurship and innovation can provide a stronger support. As long as we lead innovation with new concepts, promote it with new support, implement innovation-driven strategy, and create new growth engines with mass entrepreneurship and innovation, we can keep the economic growth at medium to high speed, and promote the economy step forward from medium to high levels. We also could improve economic efficiency while increasing quality. More support should be given to new technologies and sectors to make them new “engines” of China’s economy, while traditional industries like agriculture, manufacturing and services should strengthen their competitiveness, making themselves to be high-end, low-carbon and intelligent. You have completely upgraded the traditional metal processing industry with system reform and technology breakthroughs. 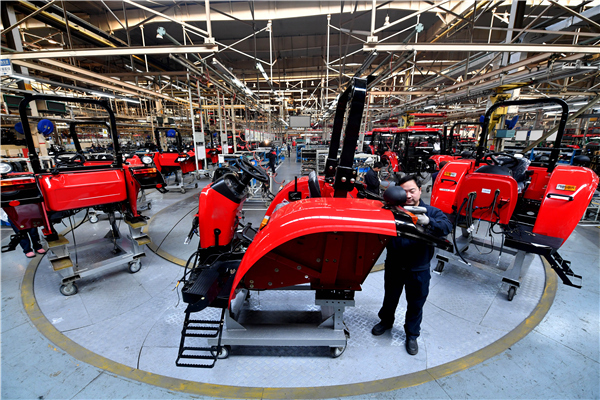 It’s a specific example of the transformation of growth engines in China’s manufacturing. It is natural that traditional growth drivers may fade in a certain period, which has been proved by many countries, especially many developed countries. In that time, the new drivers need to emerge to adapt to the new industrial revolution. And it is possible that the combination of old and new drivers may form a new mixed driving engine. I hope that you could continue the trend, with new driving forces taking the lead and old ones staying vibrant. To upgrade economic structure, we should accelerate the transformation of old and new driving forces, which comes from new technologies, emerging industries and new modes, as well as innovation in traditional industries. We could strike gold in every traditional industry as long as we catch the new driving forces. As the transformation mode from old to new driving engines is changing from time to time, the supervision and service models, such as financing support and tax calculation methods, also should be improved to adapt to the changes. It is necessary to explore inclusive and prudent supervision models to help the growth of new driving engines. Centrally-administered SOEs should serve as vanguards in revitalizing the real economy by developing new growth engines and advancing industrial upgrades. To meet the nation’s strategic needs and implement the “Made in China 2025” strategy, they should move up the industrial and value chains and increase their presence in emerging sectors, through developing revolutionary new technologies and new business models. They also should use the internet and other new technologies to upgrade their production, management and marketing models so as to revive traditional sectors. Inclusive and prudent supervision is needed toward emerging things to promote its vigorous and orderly development with the aid of new technologies and new models.